Today was the last day of deer, elk, and bear season in Montana, and I did not go hunting. Instead I went skiing, which was not yet very good, and enjoyed a clear and very cold day free from the pressure of a newly beloved outdoor pursuit I can only do three months a year. That the season is limited makes it precious, and in the last month has lent it a sense of urgency. After making it home through the snow and ice Friday, and working on some articles and processing a pile of venison Saturday morning, I took off into a snowy afternoon to fill my last deer tag. Montana will sell a doe tag for use in the Flathead Valley to as many people care to buy one, and last year over 1100 deer were shot in our fairly small area. An amazing testament to the landscape altering abilities of humans, and how much biomass a lush agricultural area can secondarily support. Even with that amount of hunting action, there are no shortage of deer out and about all winter, and a greater than normal number of fawns lived in our neighborhood this spring and summer. In spite of and because of this my 170 D tag has been the hardest to fill, measured by the hours in the field it took to find success. I had a little over 48 hours to put into my sheep hunt back in early September, and didn’t see a legal ram, though if that last big group had had one I would have been in good shape. My September Bob Marshall deer hunt was hardly 24 hours car to car, though I spent about 10 days in various parts of the Bob last year doing things wrong so I could do the them right this year. Sickness and the Grand Canyon trip took October largely off the table and meant I had one weekend to hunt elk. That trip lacked in practicality (no way was I getting an elk out of there on my own) but was top shelf in every other respect, and had a bull walked down to the river that last morning would have been an unbeatable trip. The doe tag I had for down south got filled in 5 hours. As I mentioned in that post, the number of hours I had put into local hunting up to that point was considerable, and the pace did not slow in the weeks since. Between a few weekends and more than a few mornings and evenings during the week, I cannot begin to count the hours I put into local haunts during November. It’s a different experience entirely than those other hunts. The tracts of public land available locally are small, thickly wooded, and get hit hard by hunters, especially during rifle season. The Whitetails which shelter in these places between nocturnal feeding sessions in nearby fields are extremely wary. I was determined to hunt on the ground, and had a good sense that the first deer I saw before it saw me would be the one I would shoot. But whether I would be so fortunate and skilled was far from certain. Luck is a huge part of hunting, but luck only happens to those who show up, which I kept in mind yesterday afternoon as I selected a place to park where I wouldn’t get stuck, and headed into the snowy woods. I saw a crew of 5 does and a fawn from a distance, and tried to track them and get within range, bumping them twice before they disappeared for good. An all too common experience this past month; hunting spooky Whitetails on the ground is unforgiving. Naturally, that’s when I got a break. 15 minutes later, trying to move through the woods and glass with plenty of patience, I saw two deer, 100 yards away on the other side of a draw, bedded under a tree. I immediately hit the deck, out of sight behind some brush. I had time and shelter to chamber a round and remove the scope cover, but no way to shoot from anything other than a standing position, and no good way to get closer. 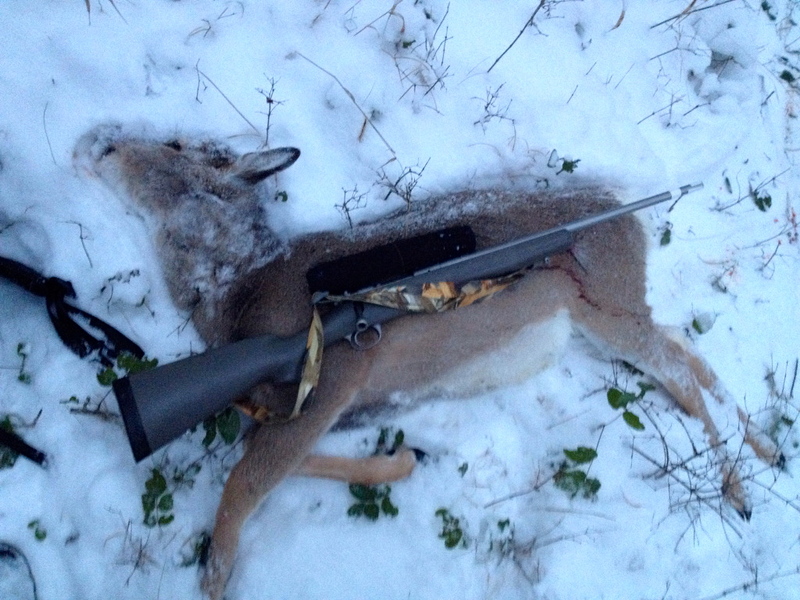 Given recent events, I didn’t want to push my luck, so I slung up while kneeling, stood slowly, aimed at the leftmost deer who was clear of the tree, plain as day bedded brown against the snow, and shot. I hit a little far back, but still punched both lungs. Once I made my way through the brush and over to the other side, I found the last deer of the season, a very dead fawn. On the Joe Rogan Experience a few weeks ago eminent hunter Jim Shockey identified Bambi (1942) as a defining catalyst in the transformation of North American towards one where the majority are unsympathetic to hunting. Shooting the equivalent of a tween deer doesn’t necessarily look good, and while I didn’t bother to think of size before I pulled the trigger, if I had I would not have done anything differently. Aside from checking my compass before I spent the first 20 minutes walking north rather than west in the dark, loaded down with deer meat. Hunting is a good way to get healthy, tasty, ethical meat. It’s also a good way to control the population of a species whom we’ve both fed lavishly and to a large extent removed from the cycle of predation. But I don’t think any hunter should pretend that there isn’t an enormous and visceral satisfaction in a hunt which ends in a kill, and not for the above high minded reasons, or even because of a goal long-tended come to fruition. Hunting has an appeal which transcends consideration, thought, and articulation. I would call my 2014 hunting season a success because my skills developed to the point where I was able to locate and consistently kill animals. I would call it even more of a success because on those occasions when I wasn’t finding and killing animals, I had a good idea of why I wasn’t, and in any pursuit where the learning potential will outstrip your time on earth, that’s as much as can be hoped for. One of the main ways that human predators differ from other predators is that we preferentially target the largest, oldest animals, rather than the young and weak. This has negative consequences we are just beginning to understand (demographics, evolution, trophic efficiency). In this sense, taking a younger fawn might be the better thing to do despite the negative stigma. For a few months now I’ve been looking for a non-selfserving justification for targeting older, larger critters (of whatever gender). Haven’t found one yet. Dave, it’s been great reading about your developing hunting career, particularly how much insight you came into this year. I occasionally found myself re-reading your words when I was getting down in the dumps and not successful at times this fall. I penned most of my season’s experiences last evening and will be putting the final touches on it in the coming hours for publishing on my blog. A truly insightful year this has been. Enjoyed following your season. Congrats!